Introduction to Early Childhood Education: This is a one-credit, one-semester course designed to introduce the student to the principles of child growth and development, planning and implementing learning activities, principles of guiding children’s behaviors, healthy and safe environments, exploration of the child care industry and career development. Basic hands-on experience working with children and their families is provided in the JRTC Preschool. 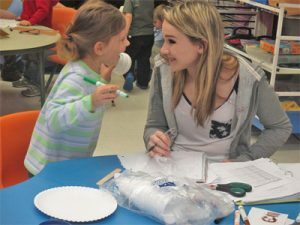 Early Childhood Education II: This is a two-credit, one-year course designed to develop more professional attitudes and abilities and combine learned knowledge with current information and practices. Additional topics of instruction will be CPR and First Aid Training, behavior management and communication skills, learning theories, program management, and record keeping skills. Continued practical hands-on teaching experience in working with children and their families is gained in the JRTC Preschool.